From choosing classes to moving into a dorm, freshman year may seem intimidating. But, imagine if a student could go into freshman year with their questions about their university answered already by other students and a bunch of new friends on campus. Enter: Basecamp. Basecamp is a wilderness adventure that provides incoming freshmen and transfer students with a unique experience to become one with the outdoors. On these trips, students can go backpacking, canoeing or even rock climbing. 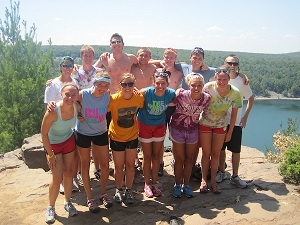 Students enjoy hiking at Devil’s Lake State Park during their Wisconsin Basecamp trip. But perhaps most importantly, Basecamp gives incoming freshmen the chance to build lasting relationships with peers and student leaders. Lee participated in a five-day backpacking trip in summer 2018. She added that she did make friends during the trip and has remained close with them throughout the school year. Basecamp not only provided Lee with lasting friendships but an opportunity to be part of a new Wisconsin Hoofers committee. Evan Fernandez, Lee’s group leader, advocated for members of his Basecamp group to join the Basic Leader Training Committee. This committee makes informational videos for incoming Hoofer leaders. 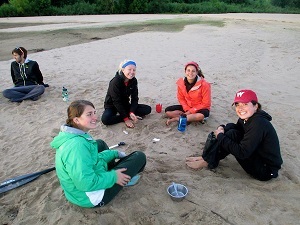 Students converse on a beach during their Wisconsin Basecamp trip. “I think one of the reasons why a lot of us [from the trip] are still really close is because the leaders were really invested in keeping us together,” Lee said. The group often still uses their group chat they created after the trip ended. From friendly faces in class to the new Hoofers committee and hanging out on the weekend, life for Lee is full of friends from Basecamp, even nearly a year later. “I’m actually getting dinner with one of them tonight,” Lee said. Basecamp provides not only an independent learning experience and the opportunity to forge friendships but also a means for building connections at UW. It allows freshmen to take the first steps in growing into their independent lives with a solid foundation. Students can make friends and learn what it is like being a Badger through a trip like Jessica’s or through a Madison-based experience where students learn all about the outdoor activities available right on campus and in the area. To learn more about Wisconsin Basecamp, click here.